Imagine how much power Hennessey could extract from a Dodge Demon. The Dodge Challenger SRT Demon may have surpassed it, but there’s no denying that the Hellcat is still capable of absurd acceleration thanks to its supercharged 6.2-liter HEMI V8 producing an insane 707 hp. 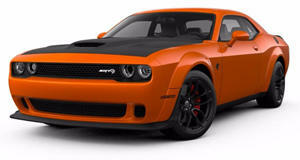 In stock form, this allows the Hellcat to hit 0-60 mph 3.6 seconds and blitz the quarter mile in 11.8 seconds. Inevitably, there will always be buyers that aren’t satisfied with stock performance. Fortunately for them, you can now buy the HPE1000 which, as the name implies, is a .
Hennessey’s creation packs an astonishing 1,012 hp thanks to a ginormous 4.5-liter supercharger that cranks out 14 psi of boost pressure. As a result of this performance upgrade, Hennessey says the HPE1000 will rocket from 0-62 mph in just 2.8 seconds and complete a quarter-mile run in 9.9 seconds at 141 mph. Hennessey recently rigged an HPE1000 customer car to a dyno to put its performance claims to the test. As you would expect, the noise this 1,012-hp monster makes is earth-shatteringly loud, and it’s a feast for the ears. At the wheels, the dyno confirms that the HPE1000 is putting 863 hp and 770 lb-ft of torque to the ground - impressive for a rear-wheel drive car. At just over 4,000 rpm, the HPE1000 produces the same power as a stock Hellcat at the redline. Of course, you could always buy a Demon which achieves similar performance figures. We already know Hennessey is planning to , so watch this space.